One of our current ongoing service project is the Shoeman Water Project! We’ve become a drop off location for this wonderful charity and are encouraging everyone to being in their new and gently used shoes for donation. Shoeman Water Projects collects donated shoes – any kind, new or gently used – from schools, churches, businesses and shoe drives, exports the shoes to street vendors in places like Haiti, Kenya and South America and uses the funds from exporting for clean water programs in communities around the world. The secondhand shoes are a valuable product for street vendors to sell at affordable prices. The end users are people who do not have shoes and cannot afford to purchase new shoes. The shoes protect the new owner’s feet from foot abrasions, parasites and mites. Funds generated from the export of shoes provide well drilling rigs, water purification systems, and hand pump repair. People who thirst receive fresh drinking water. 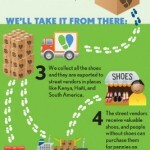 So far we’ve collected over 2,000 pairs of shoes for this project! Great work and keep them coming! During the month of June, the blessings basket is being designated for Backpacks for Kids. We have done this before and it will provide a backpack full of food for the school children of Cape Girardeau during the school year for the weekend. This is an awesome program. Please help us with this project in June. We will also be collecting school supplies in July for Central Middle school. Look for the barrel to stuff in the near future. For the month of May, we put together Hygiene Kits and Food boxes for Missouri residents. After this month with all the flooding, it will definitely be needed. We collected these for the whole month of May and our Annual Conference delegates transported them to Annual Conference to be given to Missouri Conference for use. We will update this page soon with the totals! Earlier this year, a horrible cyclone struck Mozambique, causing a lot of damage to structures as well as loss of life. Several Methodist churches and their members were hit hard by this weather event. As a result, several churches have been destroyed, people have lost their homes, and families have lost loved ones. Our bishop has requested that each church in Missouri Conference take up a donation to go towards helping our sister conference in Africa. Also, I remind you that Maple Church has a sister church in Mozambique that we have helped support over the years. We collected for Mozambique in the blessings basket for the month of April. We are waiting to get our final total that we are going to send in, but thank you to everyone who donated to this very important cause! On October 18th of 2016, we had our first ever Hope Seeds packing event. We met from 10:30 AM to 1:30 PM in our Fellowship Hall downstairs to pack seeds that will be distributed to people in need all over the world. For more information about Hope Seeds, please visit their website at: hopeseeds.org. We will be meeting again on the third Tuesday of every month at the same time and place. This is an ongoing project, so we can use your help every month! If you have any questions or would like to help with this project, please use the contact us link at the top of this page. Please prayerfully consider supporting these projects. 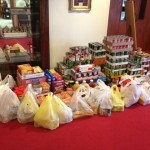 Also, each month we collect food for the local FISH food pantry and supplies for the local AMEN homeless shelter. Collection bins for these items are located in our lobby and are distributed to the organizations monthly. Our NOW (Nurture, Outreach, and Witness) Team meets regularly to plan our next service projects. If you would like to help serve or have ideas for service projects, please use the contact form link at the top of the page to let us know! We collected gifts through the month of March for the Feed my Starving children project in the Blessings basket. Our target goal was $800 to give towards this wonderful project. The total we were able to raise for it, though, ended up being $1,027.48! That is amazing! Thank you to everyone who gave! If you would like more information about Feed My Starving Children and the work they do, please click here to head to their website. We also need 20 people to sign up to work the day that we’ll be packing the meals on April the 8th. There are still spots open, so please come and help us on packing day! The sign up sheet is on the welcome center table in the lobby. We can take more than 20 people, too, so please sign up if you are able! We were able to send $350 dollars to the Amen Center in January thanks to the church’s generosity. The count for Fish Pantry was 75 for December. Thank you all for your witness to God’s blessings. We also had an awesome Christmas Trivia night. For the month of December, we bought gifts for Project Angel Tree. The Angel Tree is a program of the Prison Fellowship that serves incarcerated parents by providing a pathway for strengthening and restoring their relationships with their children and families. It is an opportunity to share Christ’s love with the families of the prisoners. Angel Tree Christmas connects parents in prison with their children through the delivery of Christmas gifts given on the parent’s behalf You, should you choose, will purchase and possibly deliver presents with a loving message from the incarcerated parent and also get a chance to share the greatest gift of all—the Good News of Jesus Christ. Angel Tree asks that this does not end with Christmas and that we continue with these children and families throughout the year. We can extend our ministry by inviting them to activities at our church, sending them birthday cards and back to school cards, & letting them know that we love them as Christ loves them. We were able to connect with 10 total families this Christmas and made some wonderful connections with some truly great people. It was a blessing to serve in this great ministry! We collected donations to benefit the Feed my Starving Children upcoming event in the blessings basket during the month of November. So all gifts that were placed in the blessings basket for month went to support our local packing event in Jackson. We will be having sign-up for the actual packing day available in the near future. So please stay tuned for that! The Christmas Shoebox collection project was a great success in October and November! We packed 52 total shoeboxes. It was great fun and these shoeboxes will be going to children in need all over the world. For more information about the Christmas Shoebox Project, please visit their website at: Operation Christmas Child. Thank you for your help on this great service oppertunity! We collected school supplies in July and it was a great success! We were able to overflow the bucket we put int he lobby to collect them! Thank you so much to everyone who went out and got the items needed for this great project. This year we collected for Central Middle School. We received a very nice thank you card from the school in appreciation of our efforts. For the whole month of June, we collected funds in the Blessings Basket for “Backpacks for Kids”. No kid should be hungry for the weekend because they are not at school and being fed two meals. We also be collected for Feed my Starving Children for the next year so we can raise money ahead of time for our part of defraying the costs. Thank you for giving to both these excellent causes! In the months of April and May of 2016, we collected items for “prison packs” that were taken to Annual Conference to be distributed to women’s prisons throughout the state of Missouri. These packs will give the women who are currently incarcerated to have personal toiletry items and personal care items. They will be a physical reminder that there are people praying for them and loving them. Thank you to everyone who helped us collect the items for these packs! Through the month of March 2016, we collected funds through our Blessings Basket to help a local Feed My Starving Children even here in the Cape/Jackson area. For more information on this great organization, click on their name. We also packed up meals at the Feed My Starving Children event in our area. We’ll be doing this next year as well, so if you would like to help out, please let us know through the “contact us” link at the top of the page. Throughout the month of December 2015, we collected items for care packages that will be made and given to both foster children through Hope House here in Cape Girardeau as well as children going through cancer treatment at Cardinal Glennon Children’s Hospital in St. Louis. This was a great way to help out some youth that really need a pick me up this time of year. We had a special dedication of these items during our Christmas Eve worship service and the items will be picked up soon to be distributed to the kids. Thank you for helping us give to children and youth this time of year! Our church hosted a Thanksgiving meal for several families from Jefferson Elementary School in our fellowship hall on November 21st, 2015. It was so great to be able to share a meal with them, make some great crafts, and burst into the pinata with all of the candy inside. We hope that everyone who attended had a great time and we look forward to doing it again next Thanksgiving! Throughout the month of July and the beginning of August 2015, we collected school supplies in our church lobby to be given to Jefferson Elementary so that children who might not be able to get everything they need for school will be able to have these items given to them. We were able to take a box full of supplies over to the school, so a lot of kids will get what they need to learn. Thank you! On the 11th of July 2015, we hosted another free block party on our lower parking lot. Just like the first time we did it in the park, there was be free food, games, and other activities as a way for us to be of service to you, our neighbors. Thank you to everyone who came out and joined in the fun! Our Blessings Basket for the month of July 2015 was designated to the backpack food program of the Cape school district. Every weekend, there are some youth that go home from school, not knowing if they will have enough food to eat until they come back to school on Monday. The backpack food program sends these kids home with a backpack full of food to last them through the week end. We wanted to help make sure that no child has to go hungry, so if you would like to still donate to this wonderful cause, let us know and we will get your gift to the program that handles the program. As always, 100% of everything that goes into the Blessings Basket goes directly towards helping local missions, ministries, charities, and people in our communities. On April 11th, 2015 we held a free church-wide yard sale. This was another mission project and it also benefited the Henderson Settlement mission trip . We took donations of a lot of items, but we did not be pricing the items. Instead, we let customers make donations for the Henderson Settlement mission projects if they wanted to, but everything they took was free. We did this so that it was able to help those in need in our own community by providing them with things they need and want and giving what they can to obtain these items. Many of us have donated clothing and other items to local charities for their resale shops, but this helped bring us face to face with those that are struggling. This was a double-whammy mission project and we were able to collect almost $700 in donations for the Henderson Settlement Mission Team. In November and December of 2014, we raised money for the Heifer Foundation from the Blessings Basket that we have as a part of our worship celebration. Through the generosity of those who worshiped with us, we were able to provide several animals to families in need that will help them create a sustainable life for themselves and lift their lives to a better place. Thank you to all who donated! Throughout the month of October 2014, we had two service projects that we took part in. The first of which was that we donated 100% of our Blessings Basket donations to the FISH Food Pantry located here in Cape Girardeau. Fall and Winter are very lean times of year for them and they have a lot of trouble keeping the selves stocked. 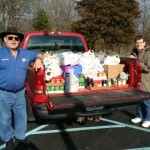 We were able to provide enough of a gift to feed 100 families (and maybe more!) through the gifts we received in October. Also, this month we collected coats for the youth and children that attend Jefferson Elementary who might not be able to afford coats on their own. There are a lot of children that go without warm coats for the winter, so any coats are a huge step towards helping them. We were able to provide dozens of coats for the children to wear. They were distributed to the school and given to the children. Thank you to everyone who donated to help these kids stay warm! Other previous service projects, like the caned food drive, school supplies drive, backpacks for veterans, and coat collection drive were a great success! We collected so much food during the canned food drive, we didn’t think it was all going to fit in the pickup to take it to the food pantry. The pantry was thrilled to receive such a donation and was so very thankful we were able to help during this very lean time. We also collected 300 school supplies to donate to Jefferson Elementary so that kids who might not be able afford all the items they need could get some help. In addition to these awesome things, we’ve also collected several loads of backpacks for our veterans and many coats for children. Great work, Maple Church!